For a special Mind themed Christmas edition of Happiful Magazine, presenter, singer and body acceptance advocate Stacey Solomon has shared her thoughts on mental health, anxiety and the pride she feels as Loose Women presents its Lighten the Load Hero award at the Virgin Money Giving Mind Media Awards for the second year running. 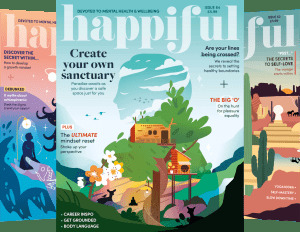 “Loose Women love Mind, and are so pleased to be working with them,” Stacey said during her interview with Happiful, the UK magazine devoted to mental health. Mind helps so many people. They provide advice and support to empower anyone experiencing a mental health problem and they campaign to promote services and understanding. Sometimes mental health doesn’t receive the same priority as physical health, because you can’t necessarily see it – but it’s just as important. Loose Women will present its Lighten the Load Hero Award at the Virgin Money Giving Mind Media Awards on Thursday 29 November. Their award will honour someone who has gone to extraordinary lengths to help someone with a mental health problem. Hosted by Mind President Stephen Fry, the Virgin Money Giving Mind Media Awards 2018 will recognise and celebrate the best possible representations of mental health across TV, radio, print and online, in addition to offering a special commendation to the Loose Women Lighten the Load Hero. Stacey also shared her own experiences of post-natal depression and anxiety with Happiful and discussed the importance of trialling talking therapies, where possible, to understand what may be of help. She spoke candidly about her own journey with anxiety and her coping mechanisms now, when it resurfaces. “The best way for me to cope with it (anxiety), is to just accept that it is a part of me. There are good sides to it, and bad sides to it. The good side is that it makes me vigilant about my health, albeit too vigilant. The bad side is that it leaves me feeling very anxious sometimes, and unable to focus on anything else. Read more of Happiful's interview with Stacey Solomon in issue 20, on sale now.